Do you have a new challenge in other areas you would like to try to welcome the new year? Last year, you promoted Full Moon, YOU AND I and What with hardly any breaks, can we expect more active promotions this year like last year or more than last year? During your busy promotions last year, were there any disappointing points? And compared to last year, what is your resolution or determination to do this year? After Japanese promotions and a World Tour, you’re planning for an Asia Tour this year too, is there anything that is slightly more improved or prepared differently compared last time? 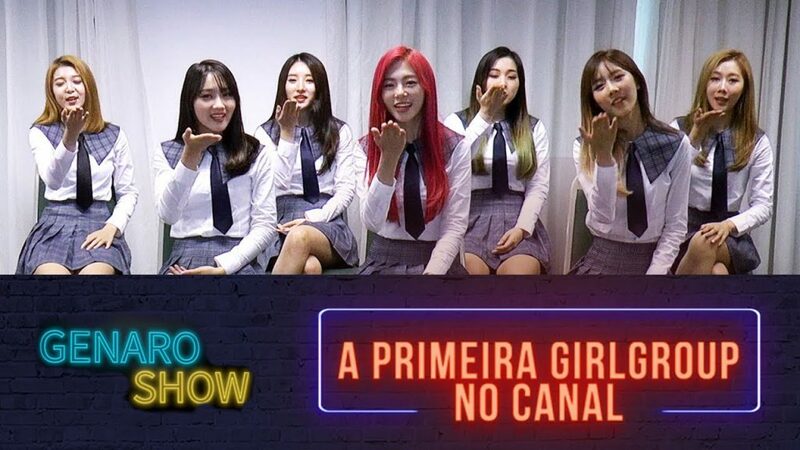 Dreamcatcher’s JiU, Sua, Siyeon, Yoohyeon, Dami, Handong and Gahyeon promoted Full Moon, YOU AND I and What actively last year with hardly any breaks. This year, on the 13th of February, Dreamcatcher will be making a comeback with their fourth mini-album, ‘The End of Nightmare’, which will be the conclusion of their ‘nightmare’ series. After their fourth mini-album promotions, they’ll be embarking on an Asia Tour to closely communicate with their foreign ‘InSomnia’. Compared to last year, what is your resolution or determination to do this year? K-style: Shibuya is a town known for the fashion of the youth. You all wear such cool clothes when you are on stage but what kind of fashion do you usually like? YOOHYEON: I have been liking vintage clothes recently. I am searching for a vintage dress on the internet currently. HANDONG: Maybe because my hair is brightly colored now but I am liking colorful clothes. But if it fades back to dark again, I may start liking black clothes (lol). JIU: While being a polished idol I like wearing simple things that match that image. SIYEON: For me, I think being comfortable is the best (lol). So my favorites are all oversized items. DAMI: I also like being comfortable so my shirts are usually just comfortable and easy to put on. My pants are usually long pants or jogging/training pants. SUA: Instead of shiny and showy things, I like a simple, plain tshirt. I also like suits or uniform-style outfits. GAHYEON: Unlike everyone else, when it comes to picking my comfort outfits, I go for a printed t-shirt or a dress or something that will give me fluffy sleeves. K-style: It seems like you have a lot of members that like anime. What is everyone’s favorite anime and anime character? SIYEON: I like the main character Kaneki from Tokyo Ghoul. Rather than his times when he is kind but I like the times when he is bad (lol). DAMI: I really like One Piece so I would have to say the main character Luffy is my favorite. SUA: I like Mama wa Pyopyosaurus ga Osuki. I watched it a lot as a kid so I think the character Jura is very cute. JIU: I like Rilakuma. It’s cute and I just like it. SIYEON: Don’t you look like him? JIU: You’re right (lol). I am also aware that we look alike. HANDONG: I like Marco from Chibi Marco-chan. The bowl-style haircut is very cute. K-style: What anime characters do you think you or one of the other member looks like? SIYEON: During our promotions for Good Night, with my navy hair, I feel I looked a little bit like Sailor Mars from Sailor Moon when I took off my glasses. Our company’s staff said it to (lol). DAMI: I am occasionally told that my personality is similar to Robin from One Piece. Our way of not saying much and using our silence to observe what our friends do and save them when needed is what I think is similar. JIU: I am often told by our fans that I look similar to Judy from the movie Zootopia. GAHYEON: I am told that I look like Peko-chan (the mascot image for the snack brand Milky). YOOHYEON: Ah! You do, you do. DAMI: When I wear bunny ears at fan-sign events, fans say I look like Marshmallow (a popular Korean bunny character). ALL: Yeah, that’s the best! You really do! SUA: I don’t get likened to characters that much. I get compared to animals such as a fennec fox or cats. YOOHYEON: I am also told I look like a dog. I can’t remember the name of it but it has long hair and is large like a human. K-style: Dreamcatcher are looked up to and admired by many women but who do you all admire? GAHYEON: BoA. She is good at dancing, singing, being an entertainer so there are lots of things I can learn from her that I am studying. I respect her a lot. SUA: I also look up to BoA since she inspired me to dream of being a singer. I also really like Heize. SIYEON: I like Hyolyn (formerly from Sistar). She is perfect in every field of entertainment she enters. She doesn’t fit into one single genre and won’t stop. HANDONG: I like Taeyeon from Girls Generation. She looks very cool while she is singing. DAMI: I also like Girls Generation. They gave me the dream to become a singer so even now I am a huge fan. JIU: I like IU. Whatever I am doing, I always want to listen to her music, it is warm and emotionally wonderful so I really admire her. K-style: Who is your favorite actor? SUA: Yesterday, when I turned on the TV, Arashi’s Masaki Aiba was there and I was so happy I couldn’t move away from the screen. I like all of the members of Arashi. They are funny, fit, I definitely want to meet them sometime. SIYEON: I like Kate Blanchett. She is fit, all of her roles are her playing my ideal woman. She has the image of a woman from today. GAHYEON: Gang Dong Won. He is handsome but he is also a good actor and sometimes, when his hometown accent comes out, he is really cute. K-style: What is your biggest concern right now? SIYEON: Taking enough vitamins and nutritional supplements. If I drink those things, I definitely can live (lol). Lactic acid fungus, vitamin D, omega 5. I take a variety of those 5 a lot. They help with my fatigue but also are good for my aging skin (lol). GAHYEON: That’s right, if you take care of it from when you are young you can be very healthy…I have a lot for me but first is getting my drivers license!! I definitely want to get it so I am looking into how to get that a lot. Also, winter is coming soon so I am thinking about getting new winter clothes. Once our activities in Japan end I think we have a day off so I am going to spend that day looking lots of things up. JIU: Recently I have been concerned about having enough comfortable clothes and have been looking online for more. SUA: I am concerned about my bangs(lol). I don’t like the idea of my bangs separating but even when I hairspray it or straighten it, I always miss something. I am always touching my bangs. DAMI: I am concerned with the cold. I get cold very easily and recently it is getting cold out so I am worried about how I can surpass this coldness (lol). K-style: Certainly, I see that Dami is the only member wearing a down coat, huh. DAMI: Yes. Even before it turns into winter, I prepared lots of warm things to wear for myself (lol). YOOHYEON: I am concerned with cleaning up. When it became fall, I suddenly had an urge to start cleaning. Recently I was doing a huge amount of cleaning in my bedroom. I share a room with SuA-unnie but I only cleaned my side of the room (lol). I have a lot of clothes so I was able to clearly sort out lots of those. K-style: If you had some time to go on vacation, what would you want to do? GAHYEON: I would go to the ocean. I don’t like swimming in the ocean but I would like to sit in a cafe where I can see it, listening to the sounds of the waves, while drinking a hazelnut latte. YOOHYEON: How realistic (lol). I usually would say the ocean but I think this time I would like to go home and visit my parents. DAMI: I want to get wrapped up in an electric blanket on my futon and watch a movie. I want to be able to have that much time to relax. SIYEON: My home is in Daegu and Suseong lake in that area is a pretty pond-like place. I want to go there with my family and take in the scenery while drinking a beer. JIU: I would also like to go home and relax by drinking a lot of beer and eating delicious foods. K-style: Do you have a food you know will just make you gain weight but you still eat it because you like it so much? SUA: I do! Hamburgers. I could eat a hamburger set every day and never get tired of it. McDonalds, I love you (lol). GAHYEON: Chicken. Bake it or fry it, no matter how you cook it, it is still delicious. But I don’t like eating samgyetang (T/N: this is a Korean soup with chicken). JIU: I think Wagyu beef is very delicious. I want to eat 100 of them (lol). YOOHYEON: I like Ichiban’s ramen. Sometimes when I am in Korea, fans will buy it as take-out for me as a present and I want them to know that I always eat all of it. Even though I know my face will get all bloated the next day, I like it so much I will still eat it (lol). K-style: Do you cook often? YOOHYEON: I only cook ramen (lol). HANDONG: I make chicken and Pho Ga (Vietnamese dish). I also really like Japanese sushi. It looks easy but I know that I would gain weight if I knew how to actually do it myself. K-style: What was it like shooting out on the streets in Japan? SUA: The town is so pretty that I get a feeling of freedom. We are in a city but I get the feeling that we are on the fringe of where the surplus is happening and then feeling of being able to go all over the place and hide. SIYEON: We are near a nursing school and there are children there playing in the garden that were very cute. Because of that, I got very invigorated by them. JIU: Wherever you are in Japan you can feel the kindness of the people, that is very nice. Even today, while we were walking, I was able to feel some of that impression. To talk of Japan is to talk of a place where lots of kind people exist. Vol.1 – “What-Japanese Ver.-” Dreamcatcher making their Japanese debut! What does “What” mean to the members? 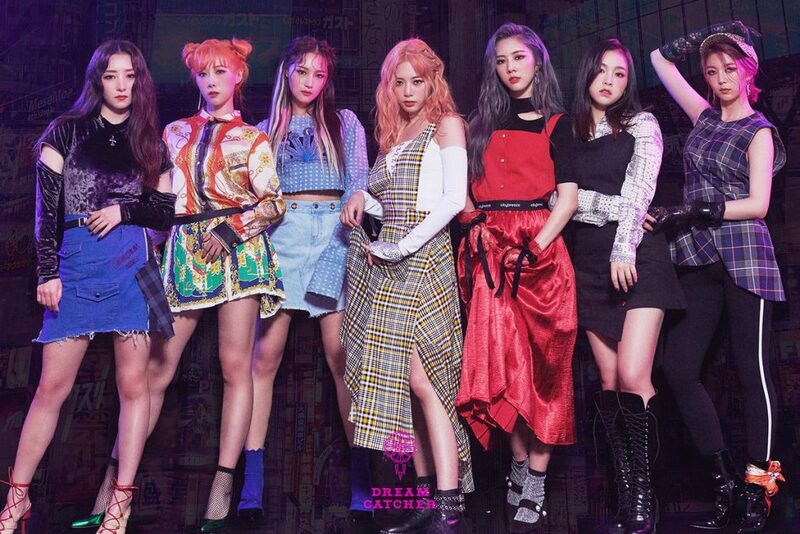 The girl group that combines the rock sounds of the bass guitar with their nightmare concept are dynamic enough to take over the the kpop world is the 7 member group Dreamcatcher who are making their Japanese debut on November 21st. Their debut song is the title song from their 3rd mini-album “AloneinTheCity” which was released in September which, when released on youtube, was viewed 1,300,000 in 10 days. The hit song “What” is being released in Japanese. Last time we talked with these girls, they were very happy and excited about their upcoming debut. Now we talked to them about the songs on their first Japanese single. K-style: When you heard that ”What” was going to be the song you debuted with in Japan, out of all of your hit songs, how did you feel? SIYEON: Although this is the song we were most recently promoting, it is also the one that feels the most different. I feel good about debuting with a song that has a bit of a different image from what we already had. JIU: I think that “What” matches the senses of the Japanese fans well. The repetition of the chorus sinks into you so I think after just listening to it once, you can remember it. I think that is a good thing. K-style: How was the recording of “What – Japanese Ver.”? SIYEON: It is important to be able to understand the meaning of the lyrics when recording to know what emotion to put into it but I was struggling with that a little bit at first. For example the line “探してる” (to search for). I needed to find the right way to sing it to convey the real emotions of that and it was kind of hard. “I’m searching for you!” (lol). K-style: Your outfits in “What” are all different and I love it but could you tell us a key point or thing you particularly like about each of your outfits? SUA: When we were doing our comeback showcase, my outfit was black with gold highlights and it was really pretty but because we used it for our first stage, we couldn’t really re-use it. I really liked it so I want to wear it again but I am so disappointed I can’t wear it again. Even now, I remember that outfit. SIYEON: My outfits are nice but personally, I think SuA-unnie has some really nice outfits. I wanted to wear her outfit as just a casual/street outfit. GAHYEON: SuA-unnie definitely has a lot of the best outfits. SIYEON: That’s why I wanted to steal them (lol). HANDONG: One of my outfits was this princess-like shirt with black puffy sleeves that I really like. I like outfits that show off the collarbone and the line of my back. SIYEON: Because you have confidence in those parts of your body. SIYEON: I wouldn’t say that about my own outfits. I have lots of slacks-type long pants. I like those a lot so that is something I am interested in. GAHYEON: I am the shortest in the group so I am sadly not really able to wear long skirts (lol) so what I realistically like is outfits based around off-the-shoulder shirts. I don’t like feeling choked in my clothes so instead of tight, body-con outfits, I like blouses or other things that leave my neck open. I haven’t had a lot of them to wear until now so I was really excited to get to wear a lot of them for this time. DAMI: All of my outfits except one or two were a pair of pants and jacket. Dancing in a skirt is hard so I was relieved to get lots of pants. I also got interested in jackets that add to broadness or my shoulders. SIYEON: Ah, you’re right. Dami’s outfits were also nice. JIU: I like outfits that give the polished image of an idol and this time was filled with those styles so I was interested in all of my outfits. K-style: It seems like Yoohyeon struggled dancing in a long skirt. How was that? YOOHYEON: The skirt was actually longer than I had thought it was so I ended up stepping on it quite a bit. But except for that, I really liked my outfit for this. The outfits were all matched to the member’s personalities which I think is really good. K-style: Dami, you participated in the writing of your rap in “What”. The lines “Tick Tock Tikita” and “Tip Toe Tikita” are like onomatopoeia (sound words) and seem to be a point of interest. Please tell us your thinking in the writing of these lyrics. DAMI: The sound “tick-tock” is the sound of a clock so the lyrics “Tick Tock TIkita” were meant to express the way time is always gradually moving and when you are busy it goes even faster. And the use of the English phrase “tip toe” was to express the feeling of sneakily escaping quickly. Since I started participating in the making of my raps, this was something I was very nervous about. When it got translated to Japanese this time, it was very skillfully expressed so I am satisfied. K-style: What is your impression after filming the music video for “What-Japanese ver.-”? YOOHYEON: We actually filmed both the Japanese and Korean versions simultaneously so it was very disordered. Since we were filming in the same place, I would mix up if I was supposed to be singing in Japanese or Korean. SUA: While we were filming both version back to back, I felt like I conveyed the emotions properly and well in Korean. When we switched to the Japanese, I don’t know why but I felt like I was sad or in pain. Maybe because the lyrics we were singing contain those kinds of emotions, I fleetingly adopted those feelings for myself. I was singing the same song, same part, and yet the feel of the lyrics was different because the pronunciation changed, making how I expressed them different. It was a weird feeling. K-style: You also recorded for your coupling song the Japanese version of your Korean debut song “Chase Me”. How did it feel to sing that in Japanese? SUA: The melody in “Chase Me” is very fast so when we did it in Japanese, it feels like it became even faster. SIYEON: After being taught the meaning of the words in the lyrics, I was able to include the emotion needed to sing it. The lyrics “嵐みたい” (arashi mitai – like a storm” allowed me to finally know the meaning behind the name of the senior group Arashi as well as understand another word to describe stormy weather. It was interesting getting to ask “What does 嵐みたい mean?” and learn all of this (lol). HANDONG: Because both Japanese and Korean are foreign languages to me, I didn’t feel this was particularly difficult. Rather, because Japanese has no final consonants, it made me more comfortable to sing it in Japanese. While singing in Korean, I got yet another impression. K-style: What was your impression after you heard your Japanese original song “I Miss You”? SIYEON: I like my part that goes “今でもあなたが好きよ” (Even now, I love you). YOOHYEON: I also really like that part! SIYEON: When I first heard that part in the guide track, I liked it and thought I would be able to express it well. I didn’t expect it to actually become my part so I was very happy recording it. YOOHYEON: I felt like I was singing something that could appear in the first part of an anime. SIYEON: Like the movie “君の名は” (Your Name). YOOHYEON: Yes, yes! A scene like a girl standing alone in a windy mountain came to me. HANDONG: I really liked my starting line “I miss you　ただ信じてる” (I miss you Please believe” so I was always listening to it. SUA: To talk about Dreamcatcher is to talk about songs with a heavy beat I think but “I Miss You” seems to have a brighter atmosphere. The song has the imagery of a bright and clear sky being reflected and I feel it is very different from our usual songs until now. K-style: Everyone seems to have enjoyed it, huh. K-style: Now a question about your song title. Thinking about the title “What”, what is something your members do that make you go “What”? SIYEON: The way Yoohyeon and Gahyeon can lay down and immediately be asleep is strange to me. The two of them usually sit in the back row of the car. I listen to music and sit in the back too. I will look back to them, however, and right after getting on the bus, they are already asleep. They even sleep well in brightly lit places. YOOHYEON: But I can easily and readily wake up if someone says my name. But Gahyeon will just not wake up at all. Even if you shake her to wake her up, she is still asleep. It is very strange. GAHYEON: There was even a time when someone pulled on my face and I still didnt wake up (lol). HANDONG: Gahyeon and I are roommates so when it is time to wake up in the morning, I can’t wake her up with just talking to her (lol). I always have to shake her. GAHYEON: But today I woke up early. Because today is the first day of our activities in Japan I think I was just very nervous (lol). DAMI: This was more around the time of our debut but JiU-unnie would go exercising after we would finish our schedule, no matter how tired she was. I thought that was strange. SIYEON: JiU-unnie would tell me after “Why did I do something like that then?” is how her approach to exercise was (lol). SUA: It was like she was addicted to exercising. Dami and I also had a period of time like that. HANDONG: The three of them had an addiction to exercise. DAMI: I used to anxious if I knew I couldn’t go to the gym and work out…But now I don’t go anymore. SUA: Now, because our schedules are keeping us so busy, even without going to the gym I am still feeling like I am getting a work out. When we finish all of our scheduled events after promotions, sleeping will take the place of that as my top priority (lol). To me, Handong is kind of strange. When we have a day off, most of the members will be resting as much as the can but Handong will meet up with her friends, going out and shopping with them. GAHYEON: Even days when we have a schedule that ends in the morning and nothing until the next day, she will still decide to go out. I asked her, “Unnie, aren’t you tired?” and she replied “Yes! I just need some time to take a breather” (lol). HANDONG: Yes. I definitely am the type of person who likes to just walk around. YOOHYEON: Your physical strength sure is impressive (lol). K-style: Is there anyone that your song “I Miss You” makes you think of wanting to see? HANDONG: My parents. It’s been 4 months since I have seen them. Through social media in China, my parents are checking and staying up to date with my activities to support me. GAHYEON: Handong-unnie contacts her parents every day. DAMI: I’d have to say my parents too. Since we came here to Japan as soon as our Korea activities were finished, it’s been a little while since I have seen them. SUA: For me I’d say Chris Hemsworth. He is very tall (lol)!! I want to be able to see him some day. JIU: I would say it is my dog, Cherry, who is back at home. How much has Cherry grown…I miss Cherry. YOOHYEON: There is a version of the movie Peter Pan I saw when I was a child where the main character Peter was played by Jeremy Sumpter. I definitely want to meet him one day. YOOHYEON: Wouldn’t you like to meet Gang Dong Won? GAHYEON: Actually that has already happened (lol). When I was still a high school student, I went to see a preview of one of his movies. I hurried there during my break time and there at the ticket booth, I met eyes with Gang Dong Won. K-style: On your October 27th free Halloween concert at Venus Fort, you all wore Halloween costumes. Are there any other costumes you would like to wear next time? JIU: When I had the yellow hair, the members told me I would suit Alice in Wonderland so I would like to cosplay as her one day. GAHYEON: I have two. First is a vampire, second is Arare from Dr. Slump. Something scary and something cute, I want to try both. SUA: Patrick from Spongebob Squarepants. Patrick or Jura from Mama Loves the Poyopoyo-Saurus (an anime) is what I want to do but it seems like the costume for Patrick is not sold anywhere. JiU: If it’s you, I’m sure it would be scary. DAMI: I want to try a character from One Piece but on the inside I know I would be okay with just any navy general outfit since I find that cool. The coat hanging from the shoulders over a white suit and a cool hat. I wanna try wearing that. SIYEON: I want to dress as the Joker from Batman. I want to try dying my hair green with spray. YOOHYEON: I want to try something unusual so I was thinking that I might say a pumpkin but after thinking about it I think that would be a little too weird so I’m gonna stop thinking about that. SIYEON: Huh but that would suit you so well. K-style: On your world tour you visited Asia, South America, and Europe. What is something unique to the fans of all of those places? HANDONG: In Asia, fans will express themselves by clapping. But in Poland, they did the same thing by stomping their feet. At first I was surprised and confused but after I heard that is what they were stomping for, I thought “Oh, I see”. SUA: The people in Europe and South America copied the outfits we had worn on stage. They learned the dances and that made me really happy. GAHYEON: Asia has the “give and take” culture so there were lots of shy fans. SIYEON: In Europe and South America, there were often moments I was worried about communication difficulties being pushed to the limit. We would speak in Korean and then it would get translated but, even before the translation was said, without knowing what we were saying the fans would react and scream for us. That made me feel so good. GAHYEON: It gave me the feeling of receiving energy from them. JIU: I feel like our Japanese InSomnia are very delicate. THey worry about our condition and if we got hurt on stage or not, they are looking over us with all their hearts. I really do feel that warmth. SIYEON: At our promotions in Japan yesterday, people were crying. I feel like I will see more of that while I am in Japan. K-style: Finally please give a message to our readers. JIU: Japanese InSomnia! You have waited very long for our Japanese debut, haven’t you? In order for us to have a concert in Japan, we need you to listen to listen lots to our song “What – Japanese ver.-” and fully understand all of the lyrics. I am so happy we can experience this together. I am very happy Dreamcatcher is so loved and highly anticipated!! I want to give (deuri) / my heart to my loved ones (im), like diamonds glittering with 10 / carat (kae) is Dreamcatcher / please take a look (chyeo) at us. 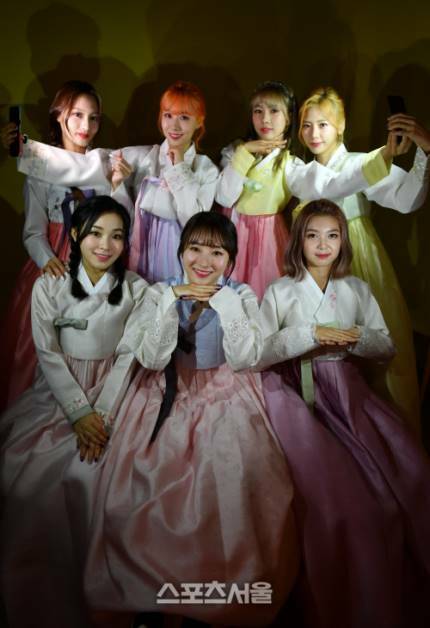 The music of the group Dreamcatcher (Jiu, Sua, Siyeon, Handong, Yoohyeon, Dami, Gahyeon) is good to get closer to on Chuseok. The team name Dreamcatcher’s originates from a native american decorative item, which, while possessing it, has the effect of eliminating nightmares and making one dream good dreams. Chuseok has a meaning that goes perfectly well with that. 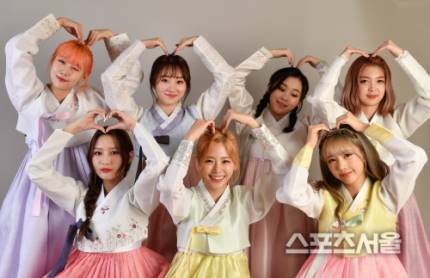 The Dreamcatcher members, who released their third mini album ‘Alone In The City’, unfolding their new nightmare story, on the 20th of September at 6pm KST and revealed the title track ‘WHAT’, had time to put on Hanbok and do a Chuseok greeting for the readers of Seoul Sports before their full-scale promotions. We asked the Dreamcatcher members to assign a score to their promotions from their debut until now. The seven members’ average score was 6.7 points. The members said: “We still have a long way to go.”, while promising: “Our potential is high”. The following are questions and answers. Q: Please introduce your third album. JIU: The nightmare story is continuing, but a different nightmare has started. Previously, we were the reason for [someone] dreaming of nightmares, but this time, the situation changed to us getting nightmares. The fact that it is a story about a new nightmare, different from the previous one, is exciting. SUA: First, the background period has changed [compared to] our previous works. If we we explained before why we were dreaming nightmares in and old-fashioned atmosphere, we dealt with stress that you receive in modern times this time. It is a story the listeners can relate to. GAHYEON: While before, our clothes were adjusted to fit in unity, this time, we keep alive individual characters, each with different clothes and colours. SIYEON: It is a song of the symphonic rock genre that includes shouting and a hook that overflows with addictive qualities and a strong message. Q: Last year in January, you debuted. Please grade your promotions since then on a scale from 1 to 10. SIYEON: 3 points. Before our debut [as Dreamcatcher], I thought we were doing well. Now, I also strongly believing that. It still hasn’t met my expectations yet. YOOHYEON: 1 point. There will be many days I spend with the members in the future. Until the day I die, I want to fill up the remaining 9 points. JIU: 9 points. Even though we improve day by day, I gave one point less to show ‘instead of showing off, let’s work hard’. DAMI: 7 points. I’m giving one point for each member, so 7 points is a perfect score. Let’s stack up the remaining 3 points as a team. HANDONG: 8 points. There is room for more development, we have a lot of potential. GAHYEON: 9 points. Even though I want to give our teamwork 10 points, we could not yet reach our peak as a team. We have a long way to go. SUA: 10 points. [Our promotions] have been without a hitch. I want to give 10 points to the fact that we can rely on each other. I want to go on with self-esteem. Q: What is a wish you have for this full moon? What do you wish for your fans? SIYEON: I want to dilligently practice composing. I want to let our fans hear it as soon as possible. I hope our fans stay the way they are! YOOHYEON: [I want to] travel somewhere with my mom during this time of rest. If we could go, I would want to travel. I hope our fans will always be healthy. JIU: I don’t have any wishes. Right now, I am satisfied. I don’t wish for anything lately. I hope our fans, too, can be happy without worries. DAMI: I wish I could become fluent in a foreign language. To communicate with our foreign fans, I should to be fluent in their languages. I hope our fans are eating and sleeping well. If we start our promotions, they will [probably] not rest, because we need to spend them together. HANDONG: Personally, I wish I could take the members to my home country, China. To our fans who always do well, I always feel thankful. GAHYEON: I wish that nobody gets sick, and that you don’t lack anything. SUA: I think of myself that I am still young, but I wish to grow up. I hope to become a person that will learn a little more. (?) I want to always develop. Q: What is Dreamcatcher’s full moon wish? TOGETHER: We want to chart [with our album]. We wish our teams genre fusion of rock and dance will become popular. Since our overseas online streaming results are rising gradually, too, we hope to become a team that goes abroad more. If we went to a variety show, we could probably show funny images of our individual character explanations. Q: What are your goals and resolutions for the future? JIU: We will try hard to always show our sharp group dances and powerful performances. We will do our best to achieve our goals without losing our original intentions. Q: Please make a four syllable acrostic poem with ‘Dreamcatcher’. SUA: Finally (deu) / loved ones (im), we came back! / Please catch (kae) us, / don’t only look at us (chyeo), come closer! JIU: I want to give (deuri) / my heart to my loved ones (im), like diamonds glittering with 10 / carat (kae) is Dreamcatcher / please take a look (chyeo) at us. Q1. Dreamcatcher, you had a comeback after a while, please greet the Genie Music family. Dreamcatcher: Genie Music family, *kiss* Dream of us! Hello, we are Dreamcatcher, returning with our third mini album and a new nightmare story. Q2. You mentioned that this third mini album is about a new nightmare story, could you elaborate what kind of concept it is? Siyeon: If Dreamcatcher’s previous albums were antique nightmare stories, this time we crossed over to modern times and are incorporating a story about ‘stress’, which is one of the reasons for nightmares. We can say that it is a combination between the stress of modern times and Dreamcatcher’s own nightmare! Yoohyeon: Yes, and also, while in previous albums, the members themselves were nightmares, we end up suffering from nightmares in this album. Among those, we end up suffering from nightmares related to stress! Q3. So this album is about stress, one of the reasons for nightmares. How do the Dreamcatcher members relieve stress? Jiu: For me, I just eat! I eat something delicious [to relieve stress]. Handong: I get rid of [stress] through talking and eating together with friends. Sua: I am someone who talks a lot. Doing something by myself does not relieve stress well for me. So I am the type to search for a way to relieve it in conversation. Siyeon: I think I usually get rid of stress by spending some time alone. Very occasionally, when the day is good and I am with people I like, I like to stay on the terrace comfortably and I like to listen to music while driving. Yoohyeon: For me, I read books like self-help books. Dami: I write down my thoughts blindly. As if resolving [stress] by talking to another person, I resolve it in my notebook. Gahyeon: I either just cry, or talk to the members about something funny and play around. Siyeon: For the light version, we shot it in front of a monitor that was illuminated by a neon sign, but because I could not feel how the lighting would come out, it was difficult. It was probably harder because it was our first time. Sua: For me, in the shade version, the atmosphere was modern and chic because of the black sand and black jackets, so because I usually like chic and sharp outfits, I shot it while being fascinated by my own appearance. Dami: For me too, during the Shade version [shoot], when we were shooting a close-up of my hands, it was fun that the staff said ‘As expected of Dami’s hands! !’ and was admiring them. Yoohyeon: For me, both the Light and the Shade version had a lot of styles that we newly tried. Because it was unique, I remember that I had fun when shooting it! Q5. Are there any memorable episodes from the album recording? Jiu: For our title song ’What’, we were singing the ‘What’ in the lyrics all together and my throat hurt more than I expected!!! At that moment, I was thinking of InSomnias, who will do the fan chant [for that part] at music shows. So I worried that they might get a sore throat ..
Gahyeon, Handong: Right! It was extremely addictive. Dami: I have the rap part ‘Tikita’ in ‘What’, so I worked hard to give it the feeling of a freshly opened soda can. Siyeon: For me, in the case of our title song ‘What’, I tried to sing a little harder than usually. It’s because I sing almost the entire chorus and the composers told me I should spit out the lyrics a little more. Thanks to that, a feeling that is a little stronger came to pass, I think. Sua: To me, it was when we were recording the track ‘Wonderland’ from this album. I usually really enjoy listening to a song from the Hip-Hop/R&B genre, but recording it first hand, it was harder to express than I thought. As much as whispering a little more subdued and riding the beat was not easy, I think I ended up falling more strongly for this song. It is an attractive song. Q6. Are there any memorable episodes from the music video shooting? Handong: Me, Sua and Dami put on fox masks and shot a scene together with Gahyeon. 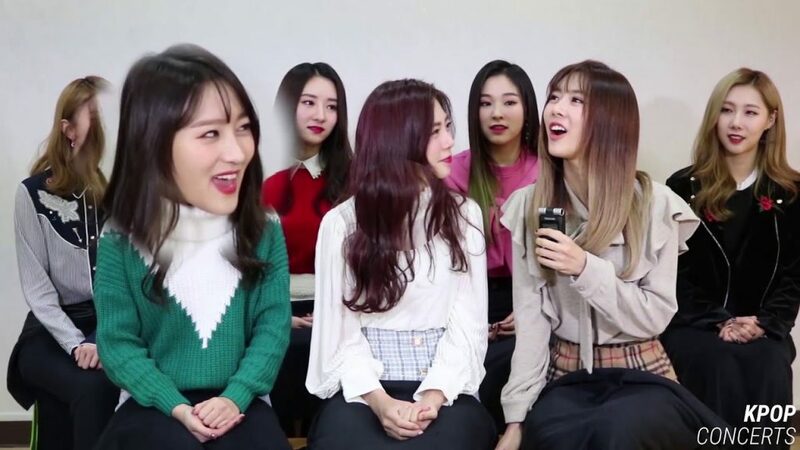 [When] Gahyeon met eyes with one of us three, we broke out into laughter. So we were told to not look into each other’s eyes and filmed the scene. Gahyeon: That’s right, at that time, when I met eyes with my unnies, we all couldn’t stop laughing. Yoohyeon: I had a part where I had to go to a high rooftop to shoot, I had to climb a ladder to get up, but every time I went up, something made a ‘Bajajak’ sound, a breaking sound..? It was really scary, but I endured it completely, pretending to be chic. Siyeon: I had a scene where I was bending my neck upwards, surrounded by black umbrella, but to receive the lighting properly, I had to turn my head upwards more than the camera. My trapezius muscle hurt a lot, but it was fun. Jiu: I had to do the same scene as Siyeon and even though my neck hurt, singing while looking at the sky was fun. Q7. Does the title song ‘What’ have any point choreography? Sua: The ‘What’ part, which is the most recurring part among all of our songs and belongs to the hook [is a point] (?). In the intro part, the colorful images that are choreographed with a delay and the movements combined together with the lyrics ‘What’ are a point! Ah! Also, the dance in a part of the chorus, where we present being locked up in the nightmare, unable to move, is also memorable. Jiu: In Siyeon’s part, when she sings ‘my dream’, our gestures are also a point! These gestures symbolize stars! It represents 7 stars. Q8. Among the tracks of the album (title included), what is your favorite song and why? Jiu: Wah, it’s hard to choose… I choose ‘Wonderland’. As soon as I heard it, I just liked it! And also because we had to divide the parts before recording it, we sang them one by one. At that time, I immediately wanted the chorus part and ended up getting it, so I really liked it. Sua: If that is so, my favorite song is ‘약속해 우리(July 7th)’. As soon as I heard the guide for it, [I was like]: ‘oh, it’s new’ and in the chorus, I ended up getting to sing my favorite part of the chorus, the melody for that part is really my style. Handong: I can’t choose just one song. For me it’s both ‘Wonderland’ and ‘약속해 우리(July 7th)’. The genre for both songs is really my style. Yoohyeon: For me, it is ‘Wonderland’! I personally like Alice [in Wonderland], and there are parts of the lyrics where the content reminds me of Alice! Dami: For me, it is the title song ‘What’! Probably because it is the song for which I participated in rap making, so it seems I got more attached to it. Gahyeon: For me, ‘Wonderland’! It is because [the song] is an existing style that we couldn’t try once before. Q9. Please say some final words. Siyeon: Everyone, you must have received a lot of stress, right? I hope it will all get blown away while listening to ‘What’~ Please scream along at the top of your voice for the ‘What What What What’ part. With your throat, you will get rid of all your stress. Dreamcatcher: Until now, we have been Dreamcatcher. Thank you. Kpopconcerts – Dreamcatcher Talks Daily Life, 2018 Goals and more! 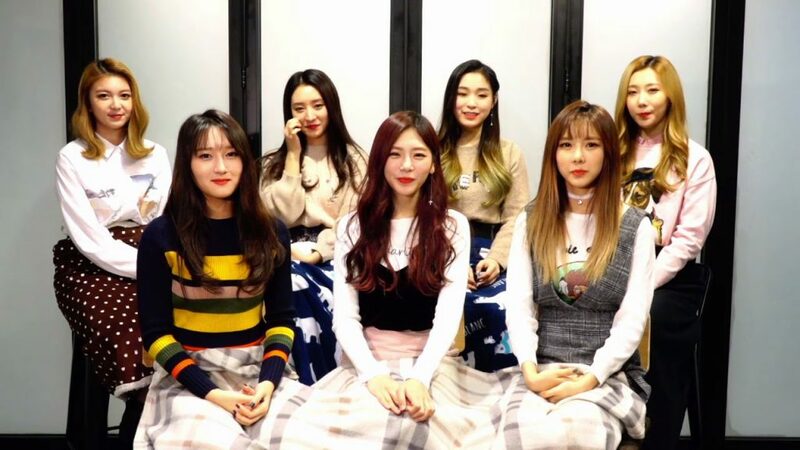 Posted on 29th January 2018 25th November 2018 by astraeax3Leave a Comment on Kpopconcerts – Dreamcatcher Talks Daily Life, 2018 Goals and more! Part 1 of a 3-part series by Kpopconcerts as they interview Dreamcatcher! Many thanks to Kpopconcerts for the interview and subtitles!